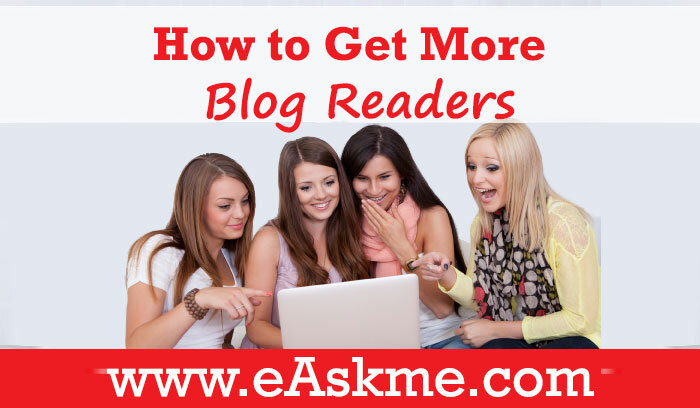 Do you want more blog reader? Why? Why your blog need them? Today we will discuss how to get more blog readers and keep them. It is not easy to increase blog readers, but if you do, then you never need to worry about traffic. The more readers you have, the more traffic your blog gets. It means it is essential to increase blog readers. Today we will discuss how to improve your blog’s readership. When you target traffic, your primary target should be converting traffic into readers. The best way to get readers is to get targeted traffic, and this always happened on a niche blog. If you run a multi-niche blog then mostly chances are that it becomes hard for you to convert traffic into readers. Search engines all prefer niche blogs. Now if you are getting some traffic and you want to get more, then this post is for you. Let's discuss how your blog compels visitors to subscribe to your blog. Social media is a big player to get you high-quality traffic and readership. You can also refer a guide of Gaurav about how to write your article for readers and search engines. Guest posting is publishing articles for other blogs; this is a famous way to increase followers and get more blog readers in 2019. If you think that guest posting is a waste of time, then you should think again: the benefits of guest posting. Guest posting is an easy way for gaining readers. Some of the best benefits of guest posting are to getting referral traffic, get a backlink and targeted traffic. Target niche blogs and sites that have a similar niche like your blog. It will increase targeted traffic which will increase your readers. This is one of the best ways to do branding and get traffic for your blog. This is a straightforward and effective way to drive targeted traffic. Blog commenting help in both networking and referral traffic. Make your gravatar noticeable and write critical comments. Comment on top blogs, comment on the blogs in your niche, blog posts. Your comments should add some value to their blog post. Also, your comments should show your knowledge. Everyone like interesting and attractive information, so do some research and find hot topics in demand. Select a topic and write detailed information about it and publish it. This helps you get new visitors and also improve your readership. Be the first to cover essential topics. Use Eagle eye concept to research the topic. Create link worthy content to attract backlinks. Subscribe to official product pages and sign up for Google alerts. Use Google instant search and Google trends to discover trendy topics. Write about mind-blowing topics with excellent information. Cover topics in-depth that are in demand. Use email subscription notes or email subscription services so that your readers can subscribe and get updates of your posts in their email. Add email subscription box in prominent place of your blog and add some beautiful lines or offer a giveaway to your subscribers. These will help you to get maximum blog readers and keep them. Attract people to subscribe to your blog. This is the most effective way to gain more subscribers. Nowadays Social Media is a powerful and easiest way to get new readers easily for your blog. Social media is full of millions of users and some of them surely be interested in your niche, and they will become the reader of your blog. This is an old but gold method. Social media is also a healthy way to promote your blog as users of social media then to share your articles which in return give you more traffic. This will get your blog more readers who are interested in your niche. Make a list of posts that perform great of your blog and start promoting them on social networks. You can use Social Metrics plugin on WordPress. “The first impression is the last impression” and “Don’t judge a book by its cover” how contradictory statements for each other but still both are true. This is what blogging is. High-quality content help your blog regarding recognition, but unique content helps furthermore. Rather than adding lots of ads, add premium ads. Offer easy navigation with a clean design. Optimize page loading speed of your blog. You can add a dedicated subscription page for readers and also write to remind your readers to subscribe via social networks. Also create subscription Thanks page. Report subscription reminder in every one or two months. I believe there are hundreds of more tips and tricks to increase your readership. Choose the advice which you prefer to do. This is a guest post by Sonya Rizones. If you would like to write for EASKME, check our guest posting guidelines.